Legislation is making payroll processing an increasingly complex undertaking. Paymaster Manx is a Manx Payroll System that helps companies to cut through the red tape by handling any combination of pay types and frequencies. Paymaster Manx incorporates all legislative changes providing prompt and accurate processing of payments. 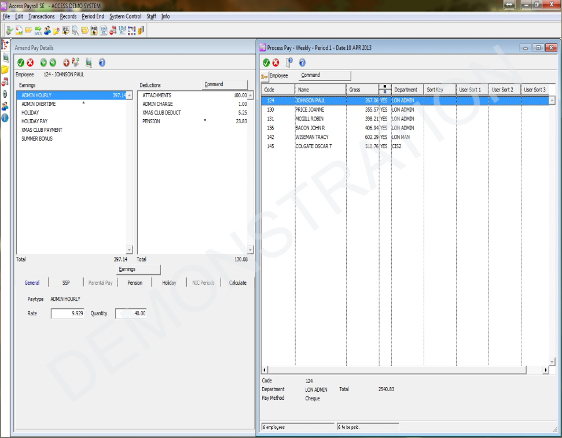 Paymaster Manx has been specifically developed to be as simple and easy to use as possible. During installation we will spend time guiding you through the basics. 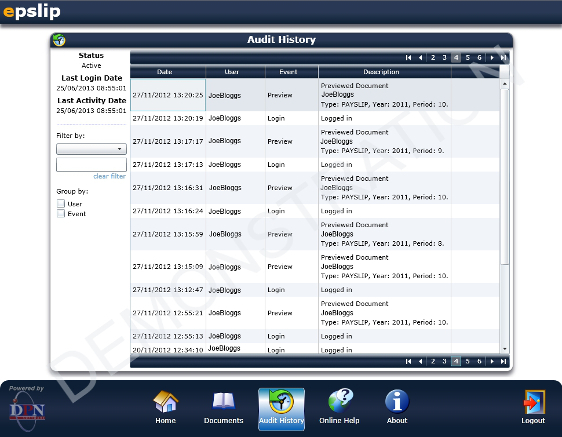 The system has a comprehensive built in "help" section and we offer telephone and email support should you need it. 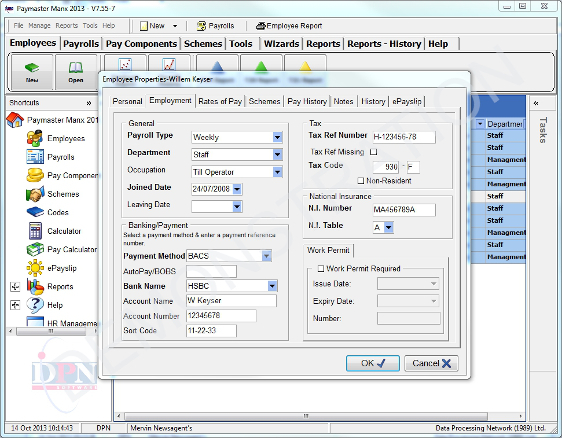 Paymaster Manx caters for every conceivable payroll need; payslips can be produced at any frequency, there is no limit to the number of payment and deduction types, pensions can be entered as a fixed sum or as a percentage of salary and additional voluntary contributions can be made at any time. Payslips can be calculated and printed within minutes and T14's, T35's and Management Reports are available at the touch of a button, greatly reducing operating costs and allowing staff more time for value-added activities. Transfer data between most of the latest Bank transfer packages and BACS software including Hexagon, Autopay, Lloydslink and Barclays Business Master/Lite. Links to third party packages are constantly being developed and special client requirements can be considered. You can also pay by cash or cheque. 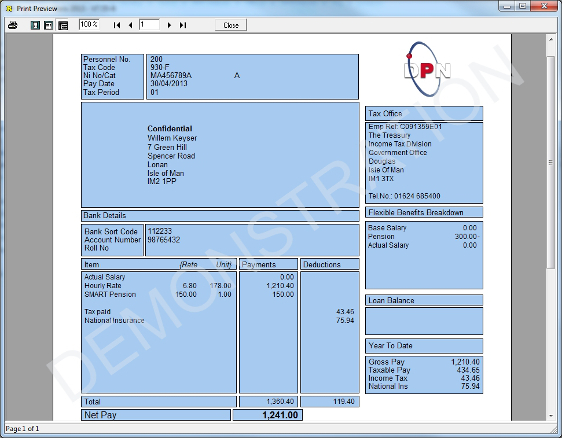 An online payslip is basically an online version of the usual printed or paper payslip that an employee receives which is available to access securely online from a company intranet or an employee self service facility. 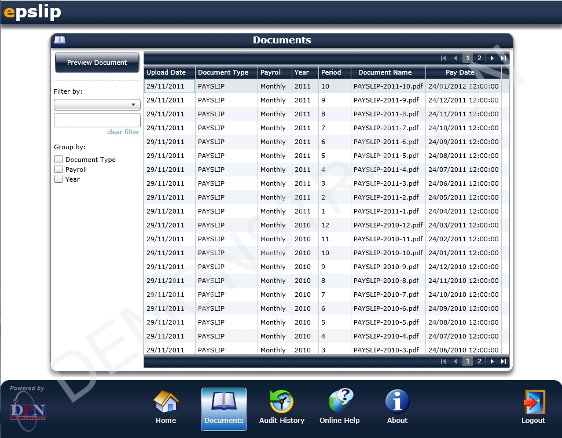 DPN Software have developed a software solution package that allows documents to be uploaded to a repository that employees can access through a website to view and download payslips. Employees are given unique username and passwords which are protected by various types of user authentication modes/databases. Employees can access current and historical payslips online at work or in the comfort of their own home 24 hours a day, 7 days a week. 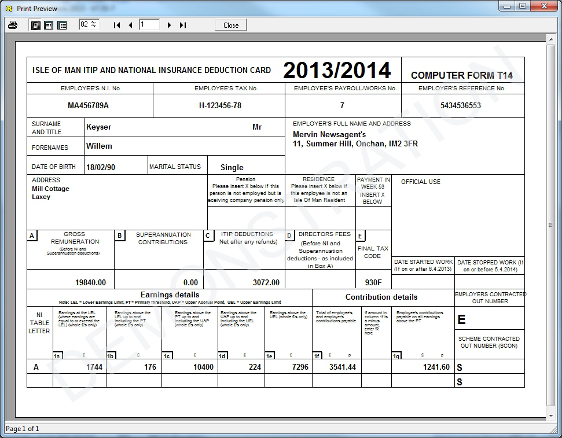 The employee can print, reducing the need to consult their payroll department. Online payslips can significantly reduce the cost of providing payslips, particularly in a large or multi-site organisation. Printed payslips and specialised sealing machines no longer need to be purchased and postage costs (if applicable) are completely eradicated. This process can also significantly reduce the time taken to produce printed payslips for each employee, thus improving the efficiency of the payroll department. Online payslips can also provide the employer with the additional opportunity to provide information over and above that which is usually included on the printed payslip. For example details of benefits which the employee receives, bonuses or even information relating to their expense claims. This type of information could potentially enhance the employer/employee relationship and assist in improving staff morale and retention. RTI ready, flexible and intuitive, SelectPay combines everything you'd expect from an HMRC-recognised payroll solution with a host of value added benefits. Selectpay goes beyond remuneration to decrease admin, improve start onboarding and efficiency. SelectPay streamlines a whole host of payroll activities. From entering new starter information and paytypes to sending payslips and P60s via email. HMRC recognised, SelectPay is designed to make it easy to comply with the latest payroll bureaucracy, including real-time information (RTI) and pensions auto enrolment. Complimentary updates are thoroughly tested in-house before they're released to you. Microsoft SQL Server combines blazing-fast performance and ease of use allowing you to run payroll, period and year end processes in minutes. 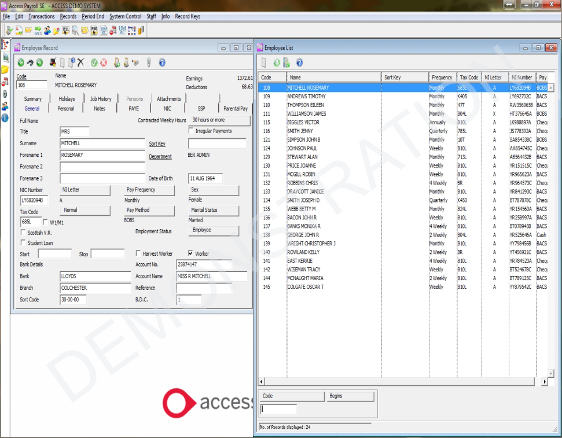 Access permissions can be deployed at individual and group level ensuring tight security over your sensitive data. 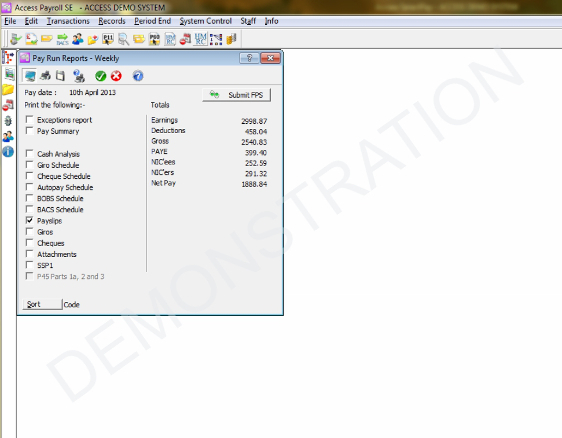 Your payroll software comes with a comprehensive range of reports as standard. These include exception report to help you validate payroll and the ability to process any amendments made since the export to BACS.